Leaves behind an incredible level of clarity with a flawless finish! 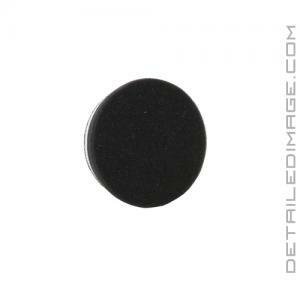 The Lake Country HDO Black Finishing Pad will provide you with an ultimate finish on even the most pesky of paints! This pad has an aggressive cell structure, but it is extremely soft in density. This allows you to achieve an amazing deep clarity finish on even the softest of paints! The HDO line of pads are perfectly balanced, cushioned, and feature thinner foam. This thinner foam reduces foam movement which will reduce heat (10% cooler) which can cause hazing and micro-marring while polishing. These pads are beveled at a 70 degree angle and this design prevents pad "rolling", allowing the pad to stay flat on the surface. The open cell cooling chamber in the center of the pad is another great feature of this pad as it helps keep the pad running at cooler temps, increasing durability and polishing results. The backing of these pads will also withstand the large throw of the Rupes, Griot's Boss and other high powered large throw machines. This pad comes in three great sizes and the 3.5" pads are perfect for 3" backing plates, 5.5" pads fit on 5" backing plates and the 6.5" pads fit great on 6" backing plates. Pair this Black pad with your favorite finishing polish to restore an amazing level of clarity and finish the paint down to perfection! HDO pads are now my go to pad for my Rupes 15 MKII. Hold up really well, excel at applying sealants (black pad).